The Funky Felter: Opening Day at the "K"
Opening Day at the "K"
That's right . . . it is opening day for my beloved Kansas City Royals Baseball Team at Kauffman Stadium. I know, I know, they have been notoriously not so great in the past, but with a new GM, several new players and welcomed seasoned veterans, and a brand new season, I have high hopes. After all, they are my home team. I am true blue for my Royals whatever the score board may say at the bottom of the 9th. My husband has been wanting to go to opening day for the Royals since we moved to Kansas City a few years ago. He's been a fan since childhood and quickly converted me to the fanaticism when we began dating. I managed to snag one ticket to the sold out game for my die hard fan of a husband. I tried to get two tickets, one for both of us, but they sold out so fast online that I could only manage one good seat that I happily gave to my husband. So today, he is setting in the sunshine watching our hopeful home team close up. I know this has nothing to do with crafting, arts, or feltmaking, but I just had to share. 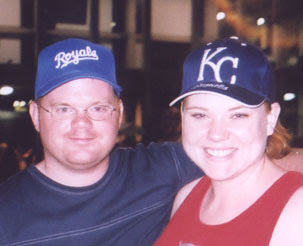 And here's a photo of my hubby and I at one of our beloved Royals' games. Woohoo, Go Royals!! I can't wait to go to a game myself!